Since 2012, we are pleased to have earned the distinction of being a “Premier Preferred Provider.” This means that Drs. Koufos and Albright have treated more than 600 patients using Invisalign. Orthodontic Specialists is proud to be considered a leading Invisalign provider in NW Indiana! Our experience has shown that many professional adult and teen patients have met the criteria and enjoy using the Invisalign product. Patients especially love our iTero digital scanner to make upper and lower impressions, without the mess, to assist in creating their custom aligner trays. In order to keep current with the latest in clear aligner technology, Dr. Koufos has traveled to Costa Rica to meet directly with the technicians at the Invisalign production facility. He has also attended the Invisalign Summit Conferences over the past six years. Dr. Koufos is impressed with their innovation and use of technology to make continuous improvements in the strength of their product. Please call us to schedule a free consultation to learn more about Invisalign and whether it’s the right technology for you! 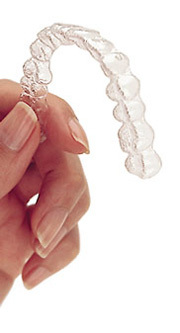 Consider Invisalign to get the beautiful, straight teeth you’ve always wanted — without braces. A complimentary consultation with us can determine if Invisalign is right for you. You’ll visit us about once every six weeks to ensure your treatment is progressing as planned. Total treatment time typically lasts nine to 15 months, and the number of aligners is between 18 and 30, but both numbers will vary from case to case. Our Doctors are “real” orthodontists! That means they specialize exclusively in straightening teeth and have 6 years of dental school education. Most orthodontists are in the top 5% of their dental class and they love what they do – making healthy and beautiful smiles!